SharePoint-Videos, the most popular online subscription service that offers, exclusively, video tutorial content for Microsoft® SharePoint®, announces the immediate availability of VisualSP™, an in context, on demand help system for Microsoft® SharePoint® 2010. With VisualSP™, task specific, “to the point” SharePoint® training video content can be accessed by end users, as needed, directly from the SharePoint® ribbon. The system serves up video training content in small groups of task specific help content, which modern Information Architecture standards for SharePoint have shown to be the optimum method of organizing training content. VisualSP™ administrators can opt to include organization-specific, custom training content in the system. As well, they can sort all of the content into custom sets for serving up to end users. SharePoint-Videos is wholly owned by Rehmani Consulting, Inc of Plainfield, IL. VisualSP LogoTM 2012, Rehmani Consulting, Inc. All rights reserved. providing end users with the in-context, on demand help that they need to be successful will increase SharePoint adoption within organizations. SharePoint-Videos has long served the growing community of organizations using Microsoft® SharePoint® with the most comprehensive set of video training content available today; therefore, the debut of VisualSPtm a video content delivery method that is completely native to SharePoint 2010 and that serves help, on demand, directly within task specific contexts is an entirely natural progression. Now, corporate subscribers, and other large organizations in the public and non-profit areas, will not only be able to locally install compelling training content directly within a SharePoint® 2010 environment. These subscribers will also be able to offer access to video training content to end users in-context with daily task operations; for example, when end users need to work with document libraries or lists. This capability was not possible prior to VisualSP™. Asif Rehmani, a Microsoft® MVP for each of the last 6 years for SharePoint®, and President of Rehmani Consulting, Inc. notes that “providing end users with the in-context, on demand help that they need to be successful will increase SharePoint adoption within organizations.” Rehmani goes on to explain that video training content that is “task oriented, and to the point, is the very best type of content to guide users correctly through SharePoint procedures”. Finally, he points to the SharePoint Ribbon as the “most comfortable point of access for end users for a task at hand” and, therefore the best in-context, on demand location for offering video help content. Initial response from prominent individuals in the SharePoint community has been very positive. Andrew Connell, a SharePoint MVP and an owner of Critical Path Training noted “[w]hat a fantastic idea and implementation. 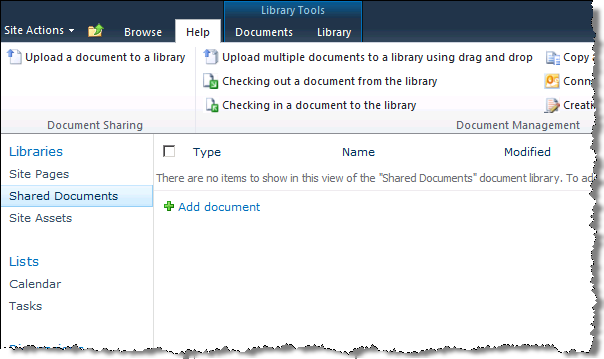 This VisualSP™ is a great assisted help solution for users working in SharePoint. Not only is help just a click away, but it’s in the context of what they are currently doing… right from the ribbon!” Mark Miller of EndUserSharePoint.com endorsed our in-context access method: "Including access to context sensitive help videos in the ribbon... I wish I would have thought of that." VisualSP™ is completely designed with large groups of SharePoint® users in mind. For example, the system is installed at the Farm Administration level for SharePoint® 2010. Once installed, all site collections within the farm will seamlessly benefit from VisualSP™. This farm-wide installation delivers video help content, with ribbon access, from all task contexts, without further integration effort. Rehmani explains that “we needed to fully construct an installation method that would add VisualSP™ video help content to all site collections before we introduced this product. Nothing less would have been acceptable.” With VisualSP™, End users have full access to a carefully chosen set of help files whenever, and wherever they require. This optimized access makes for a greater likelihood that SharePoint end users will be able to work independently, and with minimal demands on support teams. Therefore, VisualSP™ promises a rich Return on Investment (ROI). The system is also designed to support modern Information Architecture for SharePoint®, which is an exploding area of user demand. Information architects have long held that SharePoint® end users, those individuals who have few permissions, but spend the most time actually working on a SharePoint® Intranet, Extranet or Internet web site, require training content to be sorted into small groups of help. When training content options are kept to a handful of videos, rather than a long list of potentially confusing options, end users will derive the most benefit. VisualSP™ fulfills this requirement. This video help system is designed to deliver the highest levels of end user adoption for SharePoint. In fact, with video help readily available in an attractive and compelling form, there will be a much higher likelihood that end users will successfully use SharePoint®. It is important to note that Rehmani Consulting, Inc. listened carefully to the needs of its customers when it considered the development of the VisualSP™ system. Many items on customer lists of important features have been incorporated into this SharePoint-Videos product. Initial customer response has been very positive to the features and benefits that the system delivers. We have prepared a video presentation of VisualSP™, which is available for public review on YouTube. Rehmani Consulting, Inc. is one of the leading resources available today for custom training for Microsoft® SharePoint®. We are also activity engaged on behalf of customers as consultants across a wide range of technical requirements for SharePoint® and related software; for example SQL Server 2008 and 2012. SharePoint-Videos, our wholly owned online library of video training content is one of the most popular locations on the Internet for visitors in need of short, insightful training instruction for SharePoint®. Our video help content is used by many top organizations in the public and private sectors here in the United States and Internationally.